I’ve teamed up with the ladies over at MISSBISH for their MISSDISH series! I’ll be sharing delicious, easy, and healthy recipes on their blog every month :) With that said, it’s officially summer! It’s hella hot outside, and one of my favorite things to make on a hot day is a refreshing Watermelon Feta Salad! Don't be intimidated, you don’t have to do the crazy grid presentation to enjoy this, but it’s a really fun option for entertaining. This recipe is super easy to throw together and is gorgeous when tossed together in a bowl. There’s something so refreshing about cold, ripe watermelon that’s sprinkled with just a touch of salt, mixed with salty feta, cool cucumber and melon, and creamy avocado. Thin slivers of red onion give the salad a little bite, and fresh mint brings the perfect brightness. A lil drizzle of good balsamic vinegar is all you need to bring it together. Simple, delicious, perfect for summer! Start by dicing up all the components of the salad. Slice the end off of the honey dew so it can easily stand up. Halve the melon and scoop out the seeds from the center. Stand one halve up and slice the melon into ½" slices as you would a loaf of bread. Slice off the end of your watermelon so that it can stand up on it’s own. Repeating the same method with which you cut the honey dew, slice the watermelon into ½" cubes. 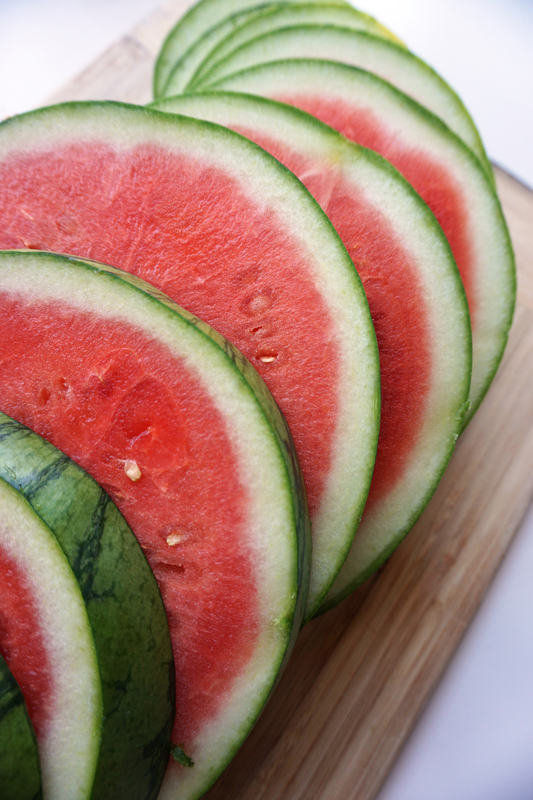 Sprinkle the watermelon with sea salt or pink Himalayan salt. I find that an easy way to achieve the same size dice is to use a cube of honeydew as a guide :) Dice the watermelon into ½" cubes. If you purchased a block of feta cheese, dice it into matching ½" cubes. Peel and halve the cucumber, dicing it into ½" cubes as well. Halve the avocado, carefully removing the pit with your knife. Spoon out the entire avocado fresh and dice into ½" cubes. 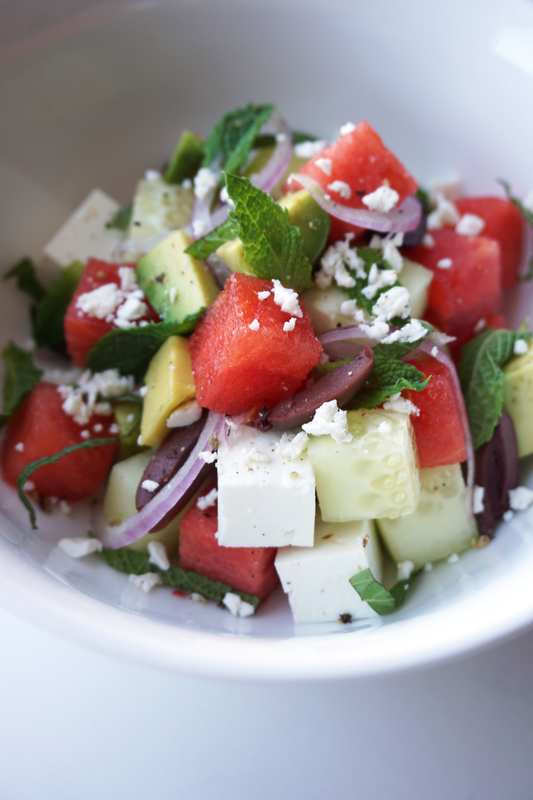 Kalamata olives are deliciously briny and work perfectly with this watermelon salad. If you’re including some in your dish, drain and quarter the olives. Thinly slice a quarter of a small red onion and break apart the slivers of onion for garnish. Wash and dry several mint leaves. Stack them on top of each other. Starting from one end of the stack, roll the leaves into a thin coil and cut the bundled mint leaves into thin slices, which will give you beautifully delicate ribbons of mint! This salad can be put together in different ways. For a beautiful presentation for a brunch or dinner party, it’s nice to place alternating cubes of honey dew, watermelon, avocado, cucumber, and feta cheese in a grid on a serving platter. There are no rules to this! Isn’t it gorgeous? The more random, the better! Sprinkle ribbons of mint and red onion over the top, and add a few cracks of black pepper. Drizzle with balsamic vinegar and serve! Another alternative that works well for large groups is to toss it all together in a bowl! The ingredients are so fresh and vibrant that it’s still a gorgeous sight for the eyes. This salad tastes even better when all the components sit and their flavors meld together. 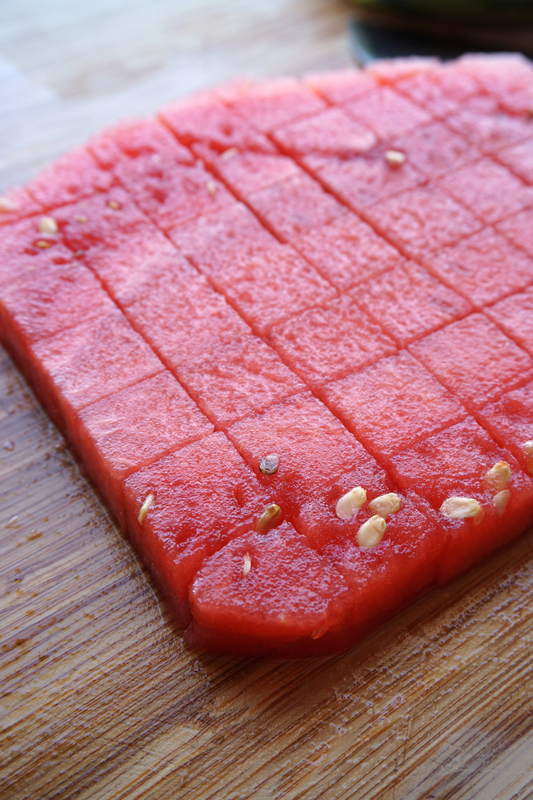 It’s amazing how watermelon can turn savory! What I love the most about this salad is its simplicity - every ingredient is allowed to shine on its own but is also enhanced by what’s around it! It’s so refreshing and each bite has a unique flavor combination! We eat with our eyes first, but this pretty dish is just as tasty as it is beautiful.